Playing a melody and a sweet accompaniment at the same time is a benchmark achievement for aspiring modern keyboard players. 'Chords for Carl is a showcase chord-study-with-melody which demonstrates an easy-to-grasp and versatile technique. Here's the final course solo performance. Chords for Carl is now available as a fully featured digital home-study download with proven anyone-can-do-it visual teaching methods, including PDF workbook and access to nine video-rich web pages. Watch this course introductory video, and you'll be convinced that you too can learn to play Chords for Carl! Here is the Chords for Carl chord sequence. Musicarta's 'left-hand-over' style is one very useful answer to that question. The left hand plays the root, the right hand plays a broken chord inversion, and the left hand plays a LH-over note/chord tone to fill out the harmony - and because it plain looks good! See the right hand chords and the LH-over notes illustration for the first four chords to the right here. Here's the chord sequence - just the chords - played using that keyboard texture. Can you follow in the chord sequence as you watch-and-listen-to the performance? The left hand plays the root (name-note) of the chord or its 'slash bass', plus a left-hand-over note. 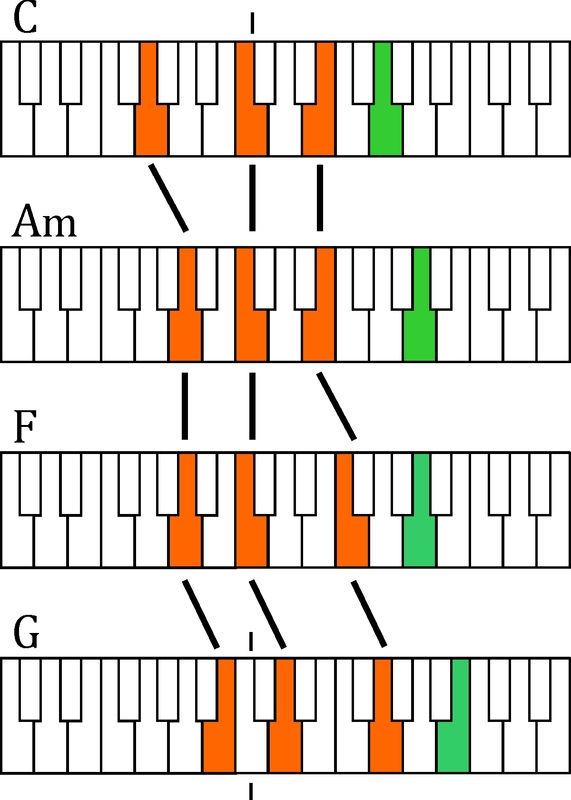 The right hand plays a broken-chord inversion of the chord in the chord sequence. There's even a Musicarta YouTube 'Left-hand-over style' playlist - click through and get inspired! You'll see how you can 'tweak' your skills to serve many different purposes. But we must have a melody, right! And - just like teacher always told you! - we learn it one-handed first. Playing a melody and a right-hand broken chord accompaniment at the same time can seem utterly impossible unless someone spells it out for you, note by note. That's exactly what the Chords for Carl workbook and teaching videos do! The music, the counts, illustrations and demonstrations: this unique teaching material can cut years of frustrating trial and error down to just a few hours of real, focused practice. Like all the Musicarta teaching material, along with a great solo repertoire performance, you get a healthy dose of 'really useful music theory' - theory you can use right there at the keyboard to make more music. Chords, chord symbols and sequences, roots and chord tones, inversions, slash chords, added tones, suspensions... - you'll be talking the lingo like a pro! And the advantage is, you learn the theory as you learn the material, all demonstrated patiently at the keyboard. No dry, disconnected theory you can't relate to with Musicarta! Still not sure if Chords for Carl is the course for you? Try Module One free and experience Musicarta's fail-safe step-by-step learning techniques for yourself. That's right! Just click here and try Module One free!